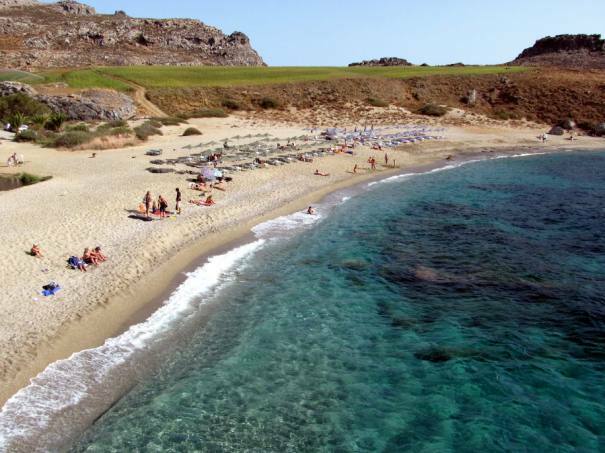 Shinaria beach is located 33km south of Rethymno town, in the wider area of Plakias. This wonderful sandy beach features a rocky seabed and crystal clear deep waters that will stimulate your senses! Umbrellas and sunbeds, showers, parking, cafe, snack, tavern, accommodation, diving center. You will find small ponds on the beach, carrying water from the surrounding mountains and are the reason for the rich vegetation. The seabed of Shinaria is one of the richest on the island with divers and nature lovers visiting the beach to explore the beautiful rock formations and enjoy the underwater world of unique beauty. Shinaria beach is also suitable for campers and naturists. Shinaria beach is accessible by rented or private cars and motorbikes or with public bus until Lefkogia village and after on foot until the beach. The very narrow road that starts from Lefkogia leads to the beach after 2km.